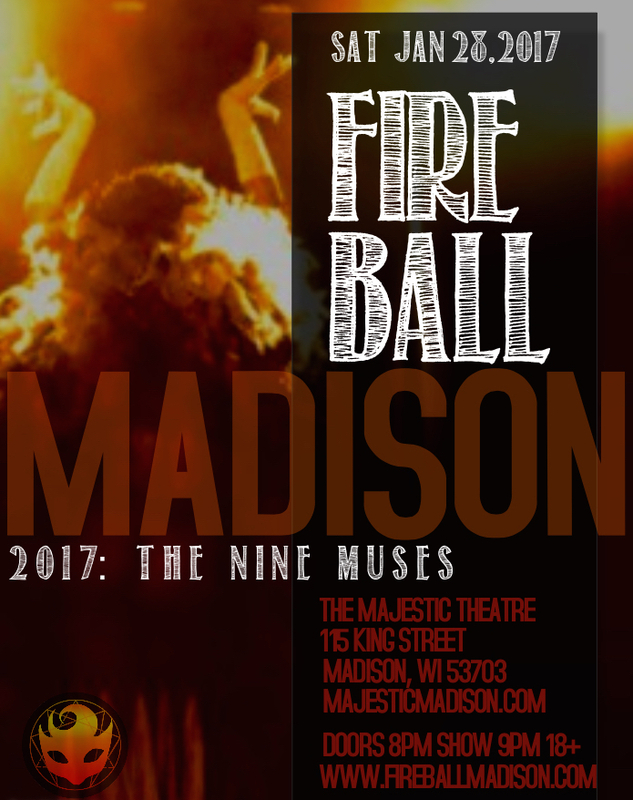 (Madison, WI) Fire Ball Productions is pleased to announce the return of the hottest night of winter entertainment in the Midwest, with Fire Ball 9: The Nine Muses – coming to the Majestic Theater in Madison, Wisconsin on Saturday, January 28! Fire Ball Masquerade continues to bring the very best in burlesque, fire performance, cabaret, aerialists, acrobats, drag artists and more for a blow-out evening of spectacle and fun. Our audiences are some of the best dressed around, too, with the whole scene representing the creativity and subversive daring of our great community. Chicago comedian and performer Miss Tamale returns as our fabulous emcee, for a show featuring performers from Madison, Milwaukee, Chicago, Minneapolis, the Quad Cities, and even all the way from California! Audience members are encouraged to dress up in whatever way makes them feel good – anything goes, from prom finery to steampunk to fetish wear to cosplay to historical reenactment to fantasy!